We use only the finest materials to create your jewellery. Freshwater Pearls, gemstones and precious metals are just some of the things that go into making our products so special. Click on the tabs below to find out more. Pearls look fabulous on all ladies as they light up your face and add radiance, something we all need! If you've been reading fashion magazines recently then you may have noticed that pearls are back in fashion. Today’s freshwater pearls are something really special – totally different from the old 'rice crispie' pearls. There are so many exciting shapes and colours at affordable prices from Kyrene Designs, which offers beautiful, high quality freshwater pearls with a modern twist, as well as the classic knotted pearl necklace. Be assured that our pearls are personally hand chosen for their beauty and reasonable price and all jewellery is carefully made by the designer. Classically strung pearls are knotted on fine silk, matching the colour to the pearl, and this means obtaining the perfect shade. If the pearls are large, or it is a long necklace, then as silk stretches under weight, the best nylon silk substitute is used. Corded silk is not recommended for fine classic knotted necklaces, but its different look can be used to great effect for more casual styles of knotting. Our other pearl necklaces are strung on professional jeweller’s wire for the best, most flexible drape. Most pearls on this site are genuine, high grade (AA) freshwater pearls unless stated otherwise. They are an organic gem and will vary slightly, where you receive an item from stock there might be a very slight difference (usually not noticeable) from the photograph. However, our knotted pearls are specially selected to match and make a pleasing uniform necklace. There are three main primary divisions – Real (freshwater and saltwater) and Faux (imitation glass) pearls, and Shell pearls which are man-made from oyster shells. These range from high quality faux - like Swarovski ® crystal pearls which mimic the weight of a real pearl by having a crystal core - to glass pearls which are very lightweight and inexpensive. Kyrene Designs only uses Swarovski. Shell pearls are formed from pearl oyster shells, ground and shaped into round ‘shell’ pearls in a high-tech laboratory. They are heated and dyed, and their weight is similar to real pearls. They are as beautiful as ‘real’ pearls yet more affordable, especially at the larger sizes. They are lustrous and you can see your reflection in them. The freshwater pearl is grown relatively quickly in a large mollusc which can produce many pearls and is therefore very prolific and produces affordable luxury. By contrast, the saltwater pearl can take several years to mature. Some years ago freshwater pearls were misshapen ‘rice crispie’ pearls which were dismissed by the serious jewellery industry. However huge advances have been made – the species of mollusc was changed and after a lot of work, the freshwater pearl now comes in all different fascinating shapes and colours. It is almost 100% solid nacre unlike the saltwater which may only have as little as 0.5-1.0mm thick mantle of nacre, rendering the saltwater more liable to be chipped. Pearls are formed within molluscs when a foreign substance invades the mollusc. In response to the irritation, the epithelial cells form into a sack which secretes a crystalline substance called nacre. Nacre is the same substance that makes up the interior of the oyster’s shell, and builds up in layers around the irritant, forming the pearl. Keshi pearls are an accident of the culturing process. The mollusc may reject the implanted nucleus before the development of the pearl has completed. 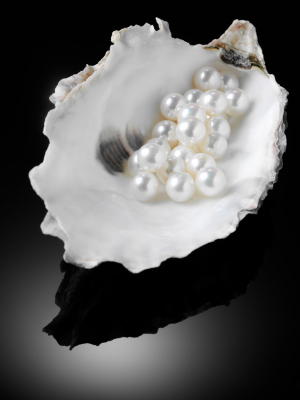 The resulting Keishi pearl is solid nacre, a substance that expels an exceptionally high lustrous surface quality. Other shaped pearls are made when a small shaped implant like a disc is inserted – the resultant pearl is a Coin pearl. Round pearls are always more rare and so command much higher prices. The near-round and oval are more prolific and therefore less expensive, and these provide a very pleasing uniform shape for a necklace, as much as a round pearl could. Baroques are uneven but very attractive in their own right. Other shapes can be less expensive but yet have the same high quality, so the new type of freshwater pearl gives huge opportunity for affordable, but quality pearl jewellery. Grades cannot be an exact science. The most common grading system is AAA, AA, A and B. AAA is the top, very lustrous (shiny), smooth, uniform; AA is extremely good quality, great lustre, smooth and pretty uniform; and A is quite acceptable – i.e. still a fairly pleasant pearl with good lustre but with a few minor blemishes. B is a dull looking pearl with more blemishes. Any ‘ringed’ pearl is of poorer quality, although they can be used to make attractive jewellery. Most pearls on this site are genuine, high grade (AA) freshwater pearls unless stated otherwise. Freshwater pearls naturally (i.e. not dyed) come in a variety of tones in white, cream, pink, peach, and a blue-toned pink i.e. lavender. ‘Peacock’ pearls (dark, iridescent black) are dyed and this is normal practice. Any chocolate, silver, blues, greens, reds etc are dyed. Proper permanently dyed pearls will not lose colour or transfer their dye. 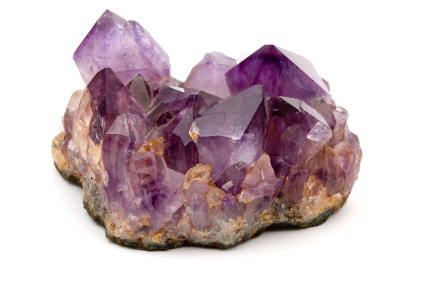 Amethyst is a hard variety of quartz containing iron and aluminium, mined mostly in Brazil, Uruguay, and Africa. Care - clean with warm soapy water. Hard and non-porous. Amethysts will lose their colour in sunlight, so keep away from direct exposure. Agate is a banded variety of chalcedony composed of quartz layers – types are Blue lace agate, Moss agate - Fire agate shows iridescent phenomena on a brown background. Onyx is a variant of agate with black and white banding. Agate with brown and white banding is known as Sardonyx. Often dyed, be wary of perfume acting as a solvent. Care - clean in warm, soapy water, rinse and dry. Do not use ultrasonics, chemicals steam cleaner, or heat. Aquamarine is a blue or turquoise variety of beryl and is found in Brazil, Pakistan and Sri Lanka. Other members of the beryl family are emerald and morganite. Care - clean in warm, soapy water, rinse and dry. Do not use ultrasonics, steam cleaner, or heat. Hard and non-porous, not prone to scratching, but can fade upon prolonged exposure to sun. Amazonite is a rare blue-green variety of microcline feldspar, mainly found in Russia and Colorado. Care - use warm water, a mild soap and a soft cloth. Do not use ultrasonics, chemicals steam cleaner, or heat. Store amazonite away from harder gemstones that may scratch the surface of this relatively soft gemstone. Ametrine is a naturally occurring variety of amethyst and citrine quartz with zones of purple and yellow, mostly mined in Brazil. Care – use warm, soapy water, rinse and dry. Hard and non-porous, ametrine can still sustain scratches so store carefully. Carnelian is a type of chaceldony agate varying from a pale orange, to an intense almost-black coloration, found in Brazil, India, Australia, Madagascar, South Africa, and the US. Care - clean in warm, soapy water, rinse and dry. Do not use ultrasonics, silver dip, steam cleaner, or heat. Carnelian may be heat-treated, so further exposure to the sun may change the colour. Coral is a calcium carbonate built up by the skeletal material of small animals that live in colonies in the sea. In ancient China, red coral was a symbol of wealth and high social status. Care – Only clean with a damp soft cloth. Porous. Do not use ultrasonics, silver dip, steam cleaner, or heat. Coral is very soft, so store it carefully to avoid scratches. Citrine is a type of quartz it is rarely found in nature in a yellow colour in Brazil and is usually heated amethyst which then turns yellow. Care – clean in warm, soapy water, rinse and dry. Quite hard and non-porous. Some citrine is dyed so be wary of perfume as a solvent. Citrine is often heat-treated to achieve its colour, so prolonged exposure to sun may affect the colour. Chalcedony is a general name for cryptocrystalline (quartz). The reasonably hard blue-green stone is what most refer to as chalcedony. The stone is found in Brazil, Germany, Russia, the U.S, Africa, Turkey and Indonesia. Dumortierite is a mineral containing aluminium salts and was named after Monsieur Domortie. Usually a denin blue colour it can also be a pinky brown or violet shade. Care - clean in warm, soapy water, rinse and dry. Quite hard and non-porous. Fluorite is a mineral composed of calcium fluoride. Fluorite's pretty colours include green, white, purple and lavender and the stone is mined in England, Switzerland and the U.S.
Care – clean in warm, soapy water, rinse and dry. Do not use ultrasonics, chemicals steam cleaner, or heat. Store away from any objects that might scratch it. Fluorite is brittle and must be handled gently, it may break if dropped – always remove when doing physical work as it scratches easily. Garnets are a group of silicate minerals formed under high temperatures and pressures and are found in Kenya, Sri Lanka, Thailand, Brazil, India, Madagascar, and the U.S.A. in reds burnt oranges and greens. Haematite. Most haematite is simulated from iron oxide. Care - use mild soap and water, rinse and dry. Soft, so handle with care. Labradorite is a sodium-rich variety of feldspar named after Labrador Canada where first found. It is a beautiful elegant grey stone with deep flashes of blues, violets and greens, called ‘labradorescence’. Lapis lazuli comprises grains of blue minerals, including lazurite and sodalite with a matrix of calcite and speckles of golden pyrite. Lapis is associated with the third eye. Mined in Afghanistan and Chile. Care – Only wipe clean gently with a damp cloth as it can be porous and may absorb chemicals, even soap, which may build up inside the stone and discolour it. Lapis is sometimes colour enhanced and perfume near the stone may act as solvent and release dye. Take care not to knock, as the stone is relatively soft. Malachite is a dark green carbonate mineral. Malachite often results from weathering of copper ores and is often found together with azurite and calcite. It is found in Russia, Africa, the USA and Israel. Care – Only wipe clean gently with a damp cloth as it can be porous and may absorb chemicals, even soap, which may build up inside the stone and discolour it. Do not use an ultrasonic cleaner or any chemical solution. Jasper is a form of chalcedony and is an opaque impure variety of silica, usually red, yellow, brown or green in colour. Blue is rare. Care - wash in warm soapy water and dry. Jade applies to two types of gemstone, nephrite, a silicate usually only in green and white. The second, jadeite, is a sodium aluminum silicate that can be many different colours. Jade is the symbol of purity and serenity. It is thought to sooth the mind bringing a feeling of inner peace. Jade can be dyed be wary with eprfume as it is a asilvet. Care – special care - only wipe jade with a soft warm, damp cloth. Do not use ultrasonic cleaners. Avoid bumping on hard surfaces as jade is delicate. Store separately and do not let jade dry out. Do not expose jade to sunlight for a long time, or it may expand and the quality will change slightly. Onyx is a cryptocrystalline form of quartz. The banding in onyx is straight, and is either brown or black and white, while curved bands occur in the variety of quartz known as agate. Care - rub lightly with a soft polishing cloth. A dab of olive oil will produce a beautiful shine. If necessary, a plain water rinse may also be used. Do not soak, do not use ultrasonics, steamer cleaners or heat. Onyx may chip or scratch, so store onyx carefully and never allow two specimens to touch each other. Paua shell is a soft organic substance which can easily get scratched. Care - Clean with a mild soap, rinse and dry. Do not expose to harsh detergents or chemicals. Rock Crystal - quartz, traditionally called rock crystal (or clear quartz), is colourless and transparent (clear) or translucent, fairly hard. Quartz is a family of minerals with the same chemical composition (silicon dioxide) and similar physical properties. Care - clean in warm soapy water, rinse and dry. Can use ultrasonics. Rose quartz is the gemstone of love and friendship and gets its colour from traces of Iron, Manganese or titanium. Care - clean in warm soapy water, rinse and dry. Can use an ultrasonic cleaner. A hardy member of the quartz family, it is not easily damaged. Smoky quartz is thought to encourage the imagination. Cairngorm stone in Scotland is a type of smoky quartz. Sodalite is a (usually blue) mineral rich in sodium and a constituent part of Lapis Lazuli – however it lacks the gold pyrite which Lapis has. Care - sodalite is somewhat fragile, so handle it with care. To clean, rub lightly with a soft polishing cloth. If necessary, a plain water rinse may also be used. Do not soak, do not use ultrasonics. Tiger’s Eye is a member of the quartz family and displays a luminescence within the stone. There is also a dark red type of Tiger’s Eye. Care - clean in warm soapy water, rinse and dry. Non- porous. A hardy member of the quartz family, it is not easily damaged. Tourmaline is a complex crystalline silicate containing aluminium, boron, and other elements. The gem comes in a wide variety of colours iron-rich tourmalines are black to bluish-black to deep brown, while magnesium-rich varieties are brown to yellow, and lithium-rich tourmalines are almost any colour: blue, green, red, yellow, pink etc. It is mined chiefly in Brazil and Africa. Care - clean in warm soapy water, rinse and dry. No ultrasonics. A hard gemstone that is resistant to both scratching and breaking, but it should be protected from sharp blows or sudden changes in temperature. Turquoise is a blue to green hydrated aluminium copper phosphate that often contains iron. Turquoise may also be peppered with flecks of pyrite or interspersed with dark, spidery limonite veining. When buying Turquoise ask what type it is. Natural hard turquoise forms under 3% of the market and is expensive. Most gemstone turquoise is ‘stabilised’, i.e. softer natural turquoise, which is waxed and oiled (mostly used in Kyrene turquoise jewellery). ‘Re-constituted’ is a much lower grade. Similar stones like Howlite can also be dyed to resemble Turquoise. Care – Special. Never immerse in water or leave in sun. Never use ultrasonics or any chemicals. Do not spray perfume or use skin creams. Turquoise should just be wiped clean gently with a damp cloth as it is porous and may absorb chemicals, even soap, which may build up inside the stone and discolour it. For cleaning adjoining sterling silver, rub silver with a polishing cloth or let the silver tarnish i.e. oxidise. Sterling Silver is an alloy of silver containing 92.5% pure silver and 7.5% other metal. It tarnishes when exposed to air so it is advisable to keep it stored in an airtight bag. Components marked 925 are sterling silver but note that small components are often not stamped. Argentium Silver is a new exciting type of silver (Argentium® 930 sterling silver) invented in the UK where germanium is added to the alloy to give it a high resistance to tarnishing. Karen hill tribe silver is made in Thailand by artisans in hill village communities. Each piece is handmade and there are many styles of beads and silver findings. 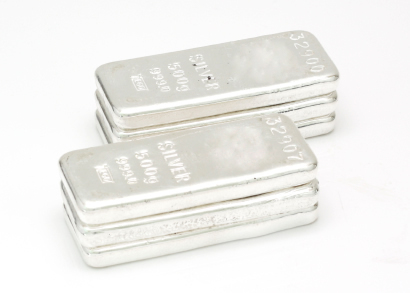 The silver is between 99.5% and 99.9% pure silver, which is a higher pure silver content than sterling silver, so it has a unique bright colour and tarnishes far more slowly. Sterling silver, quality items made in a traditional Balinese style, usually oxidised (i.e. darkened). Gold filled jewellery offers all the same physical characteristics as carat gold such as beauty, durability and strength, but at a fraction of the cost and it is impossible to casually tell the difference between carat gold and gold filled. It is made by mechanically bonding a layer of gold usually 14k (around 5% of weight) to a supporting metal and will therefore not rub off as the bond is a permanent one. With care it will last a lifetime. Wipe with a damp cloth to keep it clean. If you can wear carat gold you can wear gold filled. Vermeil is a heavily plated 22 or 24-karat gold over sterling silver – considerably thicker plating than standard gold plate. Treat vermeil with care and it will last for years although it often darkens. Avoid rigorous polishing which may make the silver underneath show and oxidise. Store in a grip bag or air tight box. Very durable fired ceramic beads, to which a layer of sterling silver or 24 carat gold is fused to the surface. These beads are a much better quality item than gold or silver plated beads as they will not flake. It is part of the character and charm of these more rustic beads that the shapes are not always uniform, neither is the surface always free from irregularities, appearing both smooth and occasionally lightly ‘scratched’.